Butterfly mobiles, our 'twinkle' butterfly style ceiling hanging mobile is pre-assembled with 5 butterflies hanging on fishing line that suspend from silver rods. These nursery mobiles are adorable way to decorate a baby nursery or little girls bedroom. Our mobiles are designed to hang from the ceiling with the attached clear line and hoop. Nursery mobiles are so cute and a quick and simple way to add color and interest to any room in your home. Hang from the ceiling above a crib, above a diaper changing table or even in the corner of the room and watch the mobiles twinkle and twirl in the gentle breeze. Mobiles do not attach to the crib and do not have music. Ideal for baby nursery, kids bedroom, girls room & home decor. Nylon hanging butterfly mobile is a perfect nursery mobile with 5 mesh butterflies have pretty twinkling color matched flower & round shaped sequins on the center and tips of the wings. These pretty organza butterfly decorations are made with a soft bendable wire frame. 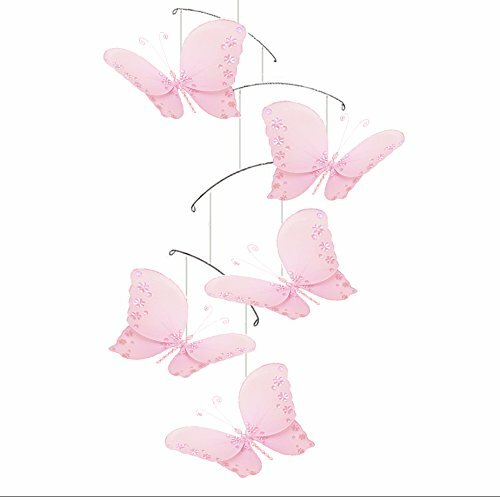 This 5 piece pre-assembled ceiling hanging mobile has adorable 5" W x 4" H butterflies. These pretty mesh nylon butterflies are made with a soft bendable wire frame. These hanging mobiiles are perfect to hang from the ceiling above a changing table, crib or the corner of a room. Ceiling hardware not included. Perfect for spaces such as child's bedrooms, baby nursery rooms, play areas. Butterflies are pre-strung with clear line and hoop for easy hanging from the ceiling. Mobile hangs approximately 24" long. Does not attach to cribs, these mobiles hang from the ceiling. Do not play music or wind up to spin. Please note: sizes are approximate, handmade & variances may occur. If you have any questions about this product by Bugs-n-Blooms, contact us by completing and submitting the form below. If you are looking for a specif part number, please include it with your message.